Gosaikunda Trek is religiously vital and naturally richer activity in the northern part of Nepal fallen under Langtang National Park. Situated at an altitude of 4,380 meters, Gosaikunda is the name of a sacred Kunda (Lake) and the main source of the popular Trishuli River. Usually from January to June for about half year the Gosaikunda Lake changes into frozen form offering spectacular views to its visitors. According to Hinduism, when the tremendous poison emerged from the sea, the lord god Shiva swallowed it to save the world from its dreadful influence. And to cool down his burning throat, he released a burst of freshwater with his powerful Trisul (holy Trident) forming a Gosaikunda Lake. Afterwards, the Lake is considered as a pure and fresh water in whole Nepal. During the festival, Janai Purnima thousands of Hindu devotees of Nepal and from India visit the place to pay homage to lord god Shiva. Taking a holy bath in this lake is believed to rinse your past sins, sorrows, and pains. Gosaikunda Trek begins with a day drive from Kathmandu to Dhunche, the gateway for all Langtang Route Treks. 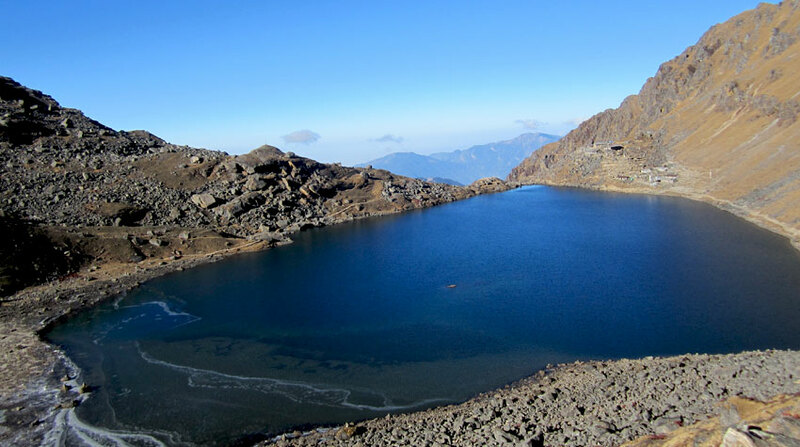 Passing some wonderful Sherpa and Tamang Villages accompanied with the magnificent views of Langtang Range Mountains and with proper acclimatization, on the third day of this trek you will reach Gosaikunda Lake - the main destination of this package. The trail follows the Rhododendron, Bamboo and Pine Trees Forest which habitats lots of wildlife. Then exit the trek from Dhunche by driving back to Kathmandu. Our itinerary is as follows. Day 01: Drive Kathmandu to Dhunche. Day 02: Trek to Thulo Syabru. Trail Attractions: Sherpa and Tamang villages and views of Langtang and Ganesh Himal. Max. Altitude: 2,260 m (Thulo Syabru). Day 03: Trek to Sing Gompa. Trail Attractions: DDC's Yak Cheese Factory and Buddhist Monastery. Max. Altitude: 3,250 m (Sing Gompa). Day 04: Trek to Gosaikunda. Trail Attractions: Rhododendron and Pine Forest, Nepal and Tibetan white peaks, Saraswati Kunda, Bhairav Kunda, and Gosaikunda Lake. Max. Altitude: 4,360 m (Gosaikunda). Day 05: Trek to Sing Gompa. Day 06: Trek to Dhunche. Drop to your hotel. Gosaikunda Trek finished here! Kathmandu to Dhunche by sharing bus/jeep. Dhunche to Kathmandu by sharing bus/jeep. Wants some modification on Gosaikunda Trek itinerary? contact us to customize it.